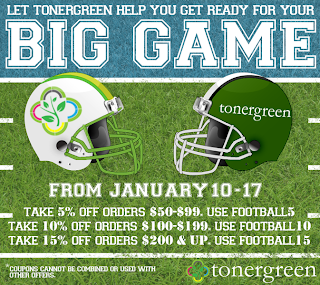 Celebrate the End of Football Season with TonerGreen's Offers | TonerGreen - Eco-Friendly Toners from the U.S. The football season is reaching its end, but there are still great reasons for you to celebrate it with a huge bang by purchasing your remanufactured laser toner cartridges and printer inks from TonerGreen and getting huge discounts. What could be greater than getting the best printer supplies while having discounts at the same time? 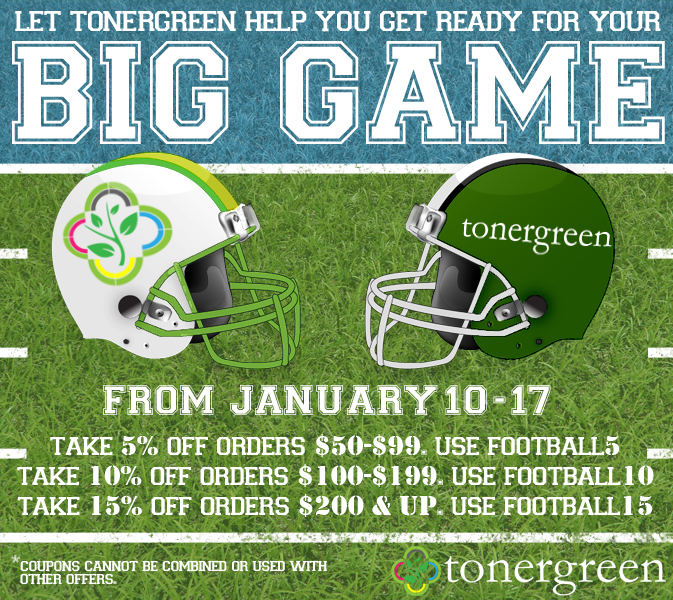 With TonerGreen, you can experience both since it has started offering its football post-season promo. All you have to do is purchase your remanufactured laser toners and ink cartridges then make sure that you total before taxes and shipping will fit the three great offers below. 1. For every order with a total price of $50-99, get 5% off by using the coupon code: FOOTBALL5. 2. For purchased products between $100-199, a 10% off will be given to you by adding the coupon code: FOOTBALL10. 3. If your order reach $200+, you instantly get 15% off if you key-in the coupon code: FOOTBALL15. So, start deciding on what banners you would make to show full support team in the post-season and print these with the eco-friendly printer cartridges made by TonerGreen. With TonerGreen, you can get both savings and high quality printing with full customer satisfaction. You are also given the chance to help preserve the environment since the printer supplies from this online store are made of recycled cartridges that have been inspected and tested to perform just like the original ones. And don’t forget that with each purchase, a percentage of the sale goes towards environmental causes through EarthShare.